The flag-draped casket of Sen. John McCain, R-Ariz., is carried by an Armed Forces body bearer team to a hearse, on Thursday at Joint Base Andrews, Md. 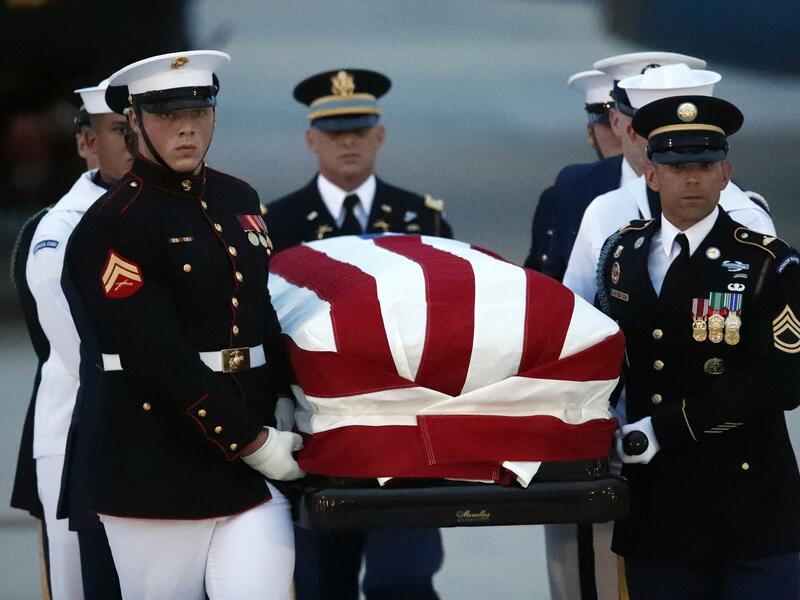 Sen. John McCain's flag-draped casket arrived at Joint Base Andrews outside Washington, D.C., late Thursday, where the former presidential candidate will lie in state at the Capitol rotunda following similar honors in Phoenix. Ordinary citizens will be among those who pay their respects to the Arizona Republican, as will his longtime congressional colleagues. However, President Trump, with whom McCain frequently found himself at political odds, will be conspicuously absent from ceremonies leading up to a private interment at the U.S. Naval Academy in Annapolis, Md., for the former naval aviator and Vietnam War prisoner. McCain, who died Saturday months after announcing that he had been diagnosed with an aggressive brain cancer, was initially honored in the state that he represented in Congress for 35 years. In an emotional eulogy in Phoenix, former Vice President Joe Biden, who served in the U.S. Senate with McCain — where the two had frequent partisan differences — said, "I always thought of John as a brother." Acknowledging that the two had "a lot of family fights," Biden said many people had failed to see past McCain's scrappy exterior to his core optimism. "That's what made John special, made him a giant among us," he said. "Things have changed so much in America, they look at him as if John came from another age because he lived by a different code, an ancient, antiquated code where honor, courage, character, integrity, duty mattered," Biden said, alluding to politics in the age of Trump, of which McCain had frequently and vocally condemned. Former presidents Barack Obama and George W. Bush are expected to speak at a ceremony for McCain in Washington on Saturday, but President Trump was not invited to participate. And, as McCain's body arrived in the capital from Phoenix, Trump was attending a campaign rally in Evansville, Ind. That follows a week in which the president has awkwardly tried to avoid the subject of McCain's death, even as fellow Republicans and many of McCain's Democratic opponents came together to honor his memory. After McCain's death was announced last weekend, the president issued only a perfunctory tweet of condolence to the late senator's family. Trump also avoided issuing a proclamation to lower flags to half-staff at all federal buildings in McCain's honor as the White House flag was returned to full staff on Monday, much earlier than is customary. Many veterans saw it as a sign of disrespect. "This whole idea the world should stop for John McCain's funeral is just a disconnect between the Republican Party and the president's priorities — including keeping the House and avoiding impeachment — and the D.C. echo chamber," said Sam Nunberg, a former Trump aide, was quoted as saying by Politico. McCain, who graduated from the U.S. Naval Academy in 1958, will be laid to rest there on Sunday.